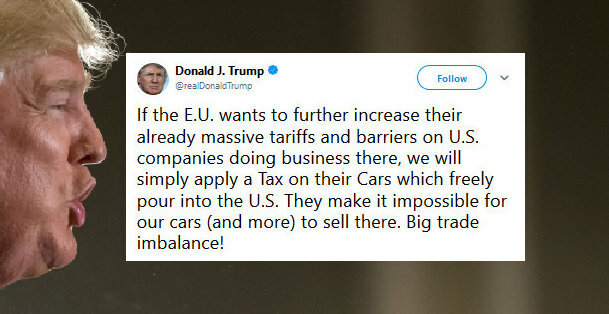 Trump Threatens Tax On European Union Cars - Joe.My.God. President Trump threatened a new tax on cars imported from the European Union on Saturday, in response to threats of retaliation against new U.S. tariffs. The European Union said Friday it was weighing potential tariffs against a wide range of U.S. goods, in response to Trump’s announcement that the U.S. would impose tariffs of 25 percent on imported steel and 10 percent on imported Aluminum.